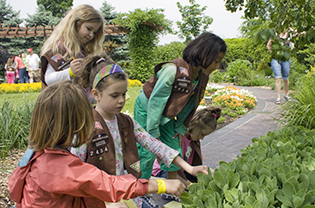 Girl Scout Daisies, Brownies and Juniors can explore the wonders of nature at the Missouri Botanical Garden. Some programs are aligned with Girl Scout Journeys themes and badges. Others explore nature and STEM concepts without resulting in an award. See each program's description for details. Each participating scout will receive a one-of-a-kind Missouri Botanical Garden patch! NO Girl Scout Troop programs will be held at the Missouri Botanical Garden July–September 2018 and December 2018–February 2019. Consider scheduling a program at Shaw Nature Reserve or the Butterfly House during these times. Journey: It’s Your World—Change It! Scouts tour the garden looking for their Daisy Flower Friends and learn all about how flowers make the world a better place! Scouts will learn where their food comes from and will examine a worm composting bin to find out how worms will help their plants grow. Girls earn their Watering Can Award as they plant and learn to care for their own fairy garden! Program length is 1.5 hours. This program is available March– June and October - November. Use a paintbrush to bring your imagination to life! We will choose from one of many beautiful spots in the Garden to relax and paint a landscape. Discover how to paint your mood. Have fun painting with different textures from nature and use items such as leaves, seeds and pine cones to create a work of art. Finally, your troop will work together to create a mural depicting the work of the famous artist, Georgia O'Keefe! During the colder months, we will use the Climatron and other indoor areas for inspiration. Meets all requirements for the Painting badge. Program length is 2 hours. This program is available March–June and October–November. What better location to earn your Gardener badge than at the Missouri Botanical Garden, one of the top three botanical gardens in the world! Tour the Garden on a fun-filled photo scavenger hunt and discover our unique International gardens. Learn more about sustainable growing methods and different techniques you can use at home. Design your own garden based on what you learned! Conduct experiments to learn about growing conditions and plant a mini garden to take home. Meets all requirements for Gardener badge. Program length is 2 hours. This program is available March–June and October.